Mary’s heart was changed at the moment of the death of Christ. When Jesus said, ‘Woman, behold thy son,’ He filled His Mother’s heart with such an influx of grace that the same maternal love She had for Him became a maternal love for all mankind. Her compassion for the sufferings of Jesus became a universal compassion for all the miseries of the world. Jesus filled her soul with unlimited mercy towards sinful mankind. Each of us is cherished by the Mother of God as much as She cherished Jesus Himself. We are souls regenerated by the Blood of Christ; furthermore, through the operations of the Holy Spirit, we comprise the Mystical Body of Christ. The spirit of filial love for Mary is one of the graces which we receive at Baptism together with Faith. Indifference toward the Blessed Virgin is an immeasurable and gross ingratitude. With the descent of the Holy Ghost on Pentecost, there began Mary’s hidden life in the Church. The Holy Ghost descended upon the Apostles as He had first descended upon the humanity of Christ; through the mediation of Mary. 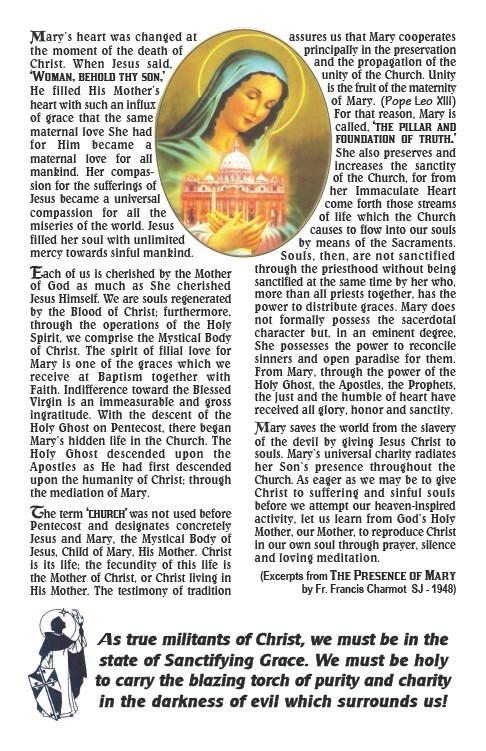 The term ‘church’ was not used before Pentecost and designates concretely Jesus and Mary, the Mystical Body of Jesus, Child of Mary, His Mother. Christ is its life; the fecundity of this life is the Mother of Christ, or Christ living in His Mother. The testimony of tradition assures us that Mary cooperates principally in the preservation and the propagation of the unity of the Church. Unity is the fruit of the maternity of Mary. (Pope Leo XIII) For that reason, Mary is called, ‘the pillar and foundation of truth.’ She also preserves and increases the sanctity of the Church, for from her Immaculate Heart come forth those streams of life which the Church causes to flow into our souls by means of the Sacraments. Souls, then, are not sanctified through the priesthood without being sanctified at the same time by her who, more than all priests together, has the power to distribute graces. Mary does not formally possess the sacerdotal character but, in an eminent degree, She possesses the power to reconcile sinners and open paradise for them. From Mary, through the power of the Holy Ghost, the Apostles, the Prophets, the just and the humble of heart have received all glory, honor and sanctity. Mary saves the world from the slavery of the devil by giving Jesus Christ to souls. Mary’s universal charity radiates her Son’s presence throughout the Church. As eager as we may be to give Christ to suffering and sinful souls before we attempt our heaven-inspired activity, let us learn from God’s Holy Mother, our Mother, to reproduce Christ in our own soul through prayer, silence and loving meditation. (Excerpts from THE PRESENCE OF MARY by Fr. Francis Charmot SJ - 1948) As true militants of Christ, we must be in the state of Sanctifying Grace. We must be holy to carry the blazing torch of purity and charity in the darkness of evil which surrounds us!